Building, Demolition, Inspiration, Planning, Um, what? 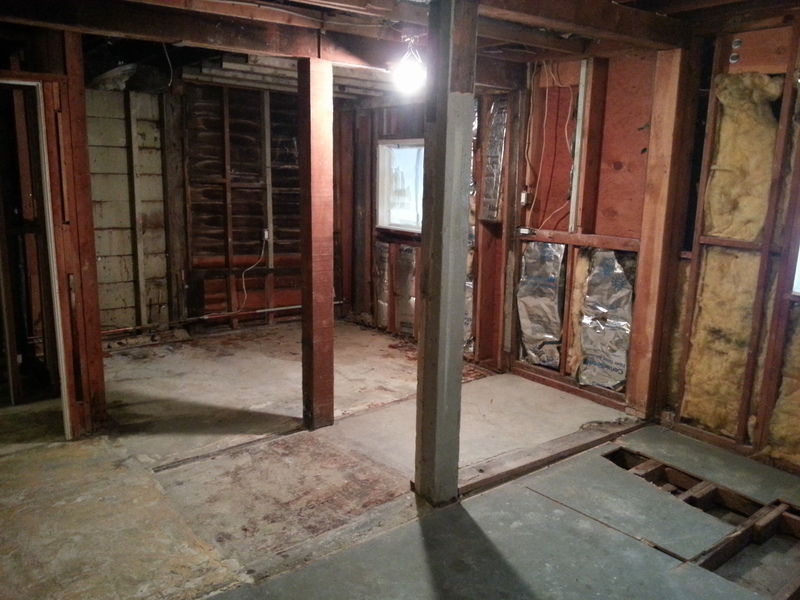 I’ve come to the conclusion that renovating a space is not entirely unlike creating a Frankensteinian monster. Don’t get me wrong, I don’t expect our In Law unit to terrorize the village locals; nor do I expect it to require a jolt of lightening before I can call this project complete. 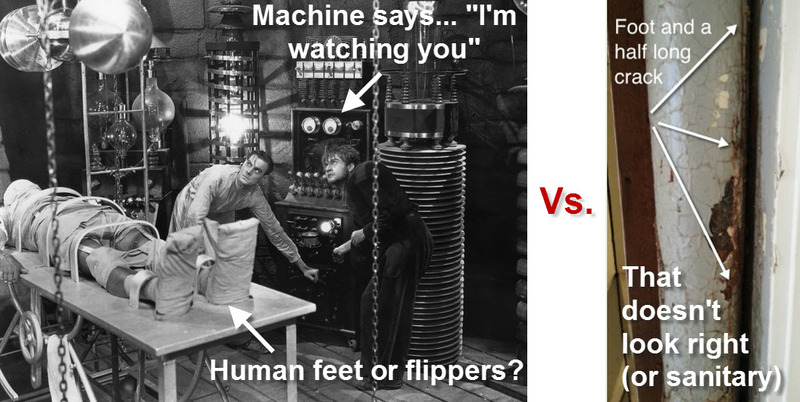 With that said, there are some similarities that should not go unappreciated. 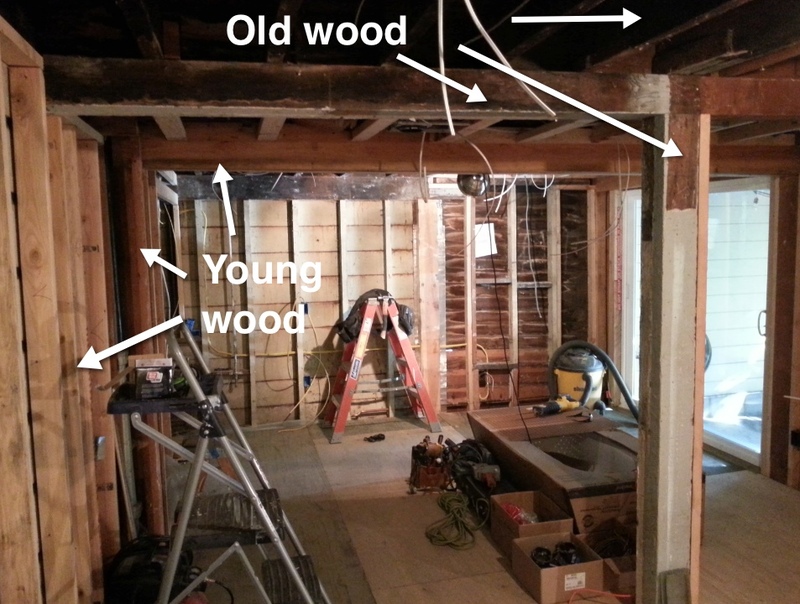 If you think of renovating as being a series of phases, we begin with the demolition phase. From a Frankenstein standpoint, this might include digging up bodies and harvesting the good parts and chucking the bad parts. “Oh..that legs is missing a foot, let’s go ahead and scratch that. 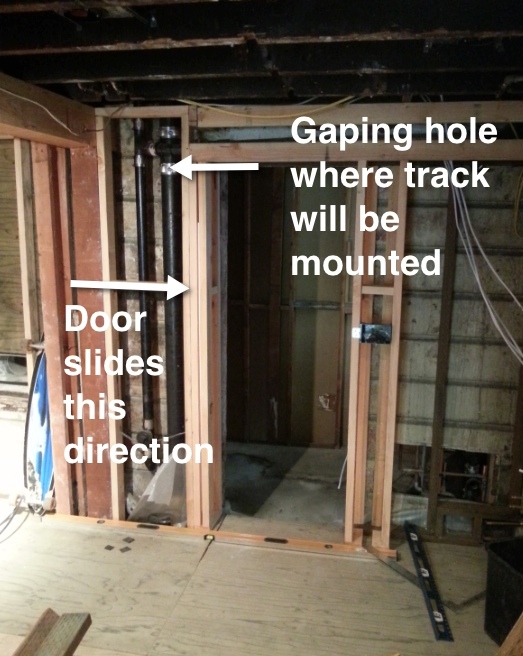 Onto the next body.” From a building standpoint, you open up the walls and identify the rotten wood, or broken pipes. Then you try to identify the parts of the space you plan on keeping. Then you’re onto phase two, “repair.” Now if I was a mad scientist, this is when I’d start opening things up and shoving things into place. A kidney here, a femur there, etc. As more of a mad-DIY’er than a mad-scientist, in this phase I prefer to put a floor in here and a wall in there. 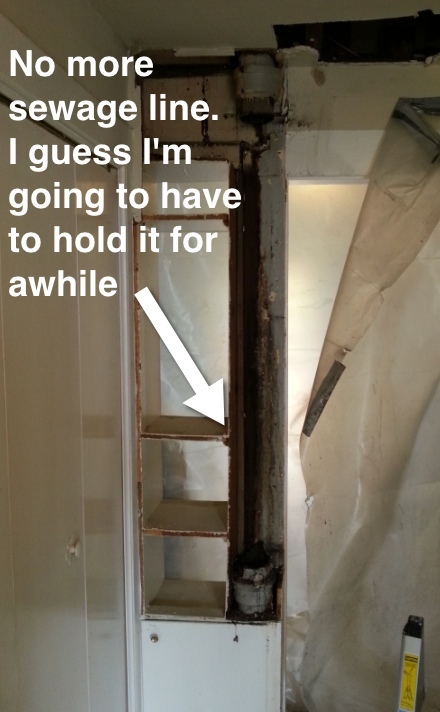 Now, as a DIY’er, this is the phase that has the highest level of instant gratification. This is when the work space magically transforms and reflects its own personality and character (more like a butterfly than a crazed zombie beast). This, my DIY following friends, is the phase I’m after!! This is the prize I have my eye on! The “Finishing” phase is right around the corner! I am officially in the final throes of the “Repair” phase and after a few stitches supports here and a new kidney electrical outlet there, I’ll finally get to move onto the finishing phase! (and don’t think I won’t yell “IT’S ALIVE!” when this is all over). Here’s the list of everything that needs to be done before I can put up drywall. 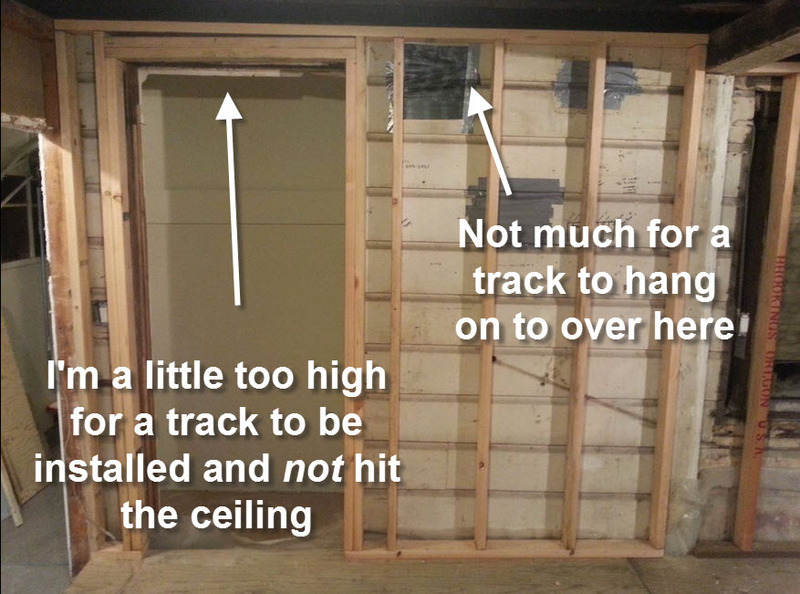 As you can see in the picture above, there is a significant drop off from the main floor of the room to the closet floor. While this didn’t bother me for a long time, when someone asked me about it the other day I decided that it would make more sense to bring it up to the height of the floor. 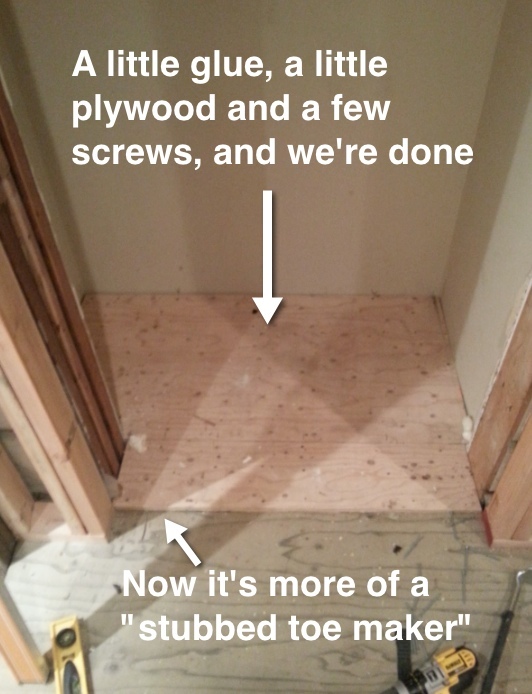 Unfortunately, the floor is about 1/2″ higher than the main room, but that may be able to be fixed when I put the new finished floor in. At least you won’t break your leg when trying to get a shirt out of the closet. It’s a…step…in the right direction. Get it? “Step” in the right direction. 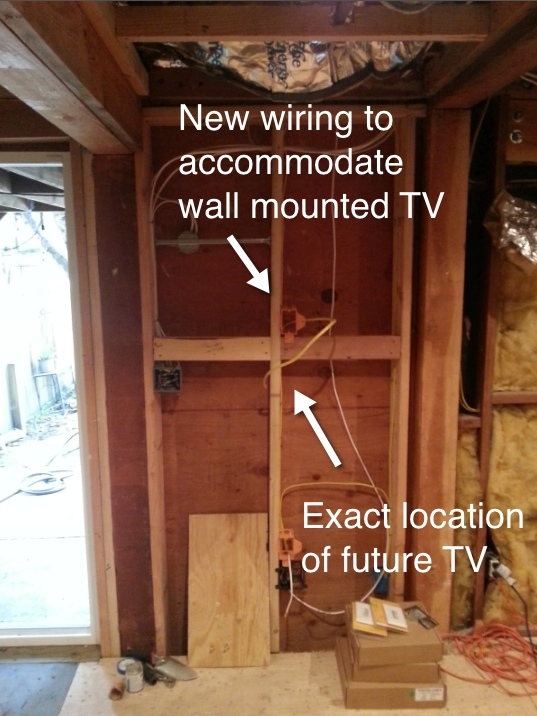 Here I just added a couple 2×4’s to the wall to give me something solid for the future attachment of the wall mounted TV arm. As you know we will have two wall-mounted sliding ‘barn’ doors in this room. 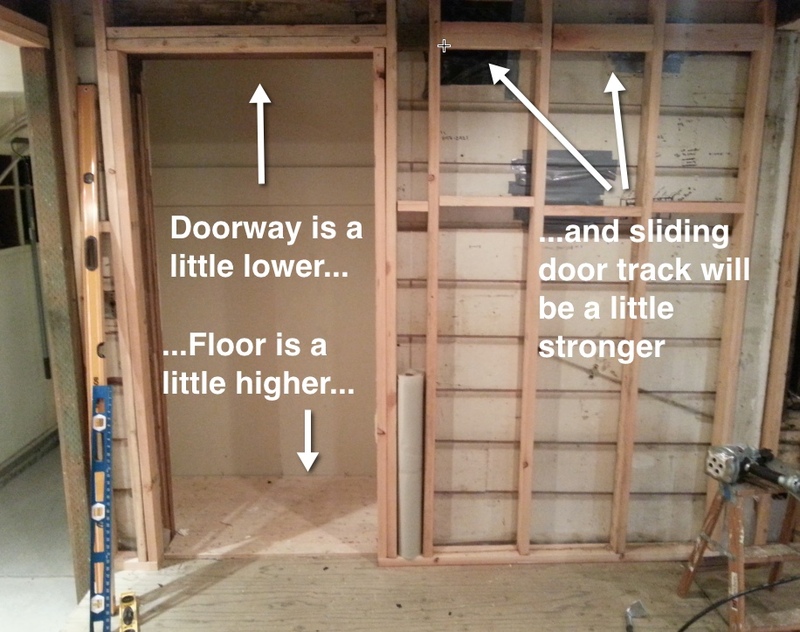 One door will be for the closet and the other will be for the bathroom. Both of these sliding door tracks will be holding anywhere from 75lbs to 200lbs, depending on what type of door I decide to buy or build. These tracks will require a lot of support to carry that weight. The bathroom door will also be on a wall mounted track, although this one will be a little smaller to fit in the limited space. 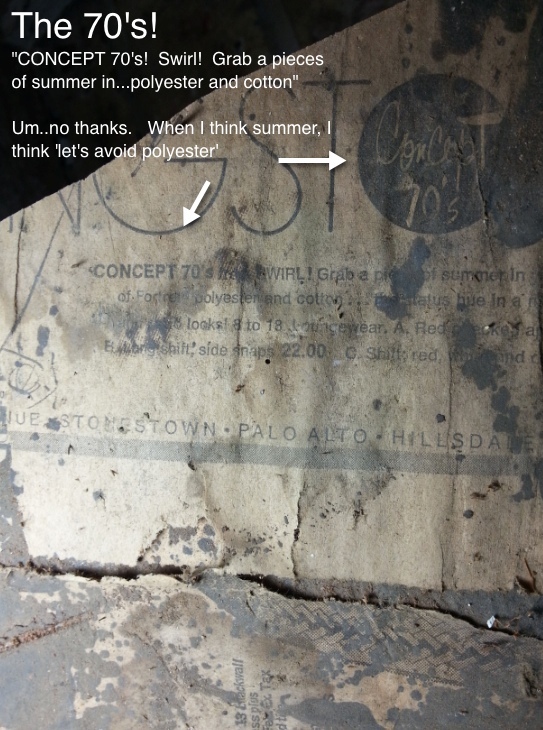 As you may recall, I intend to drywall between the ceiling joists so that about 2″ of wood remains exposed. 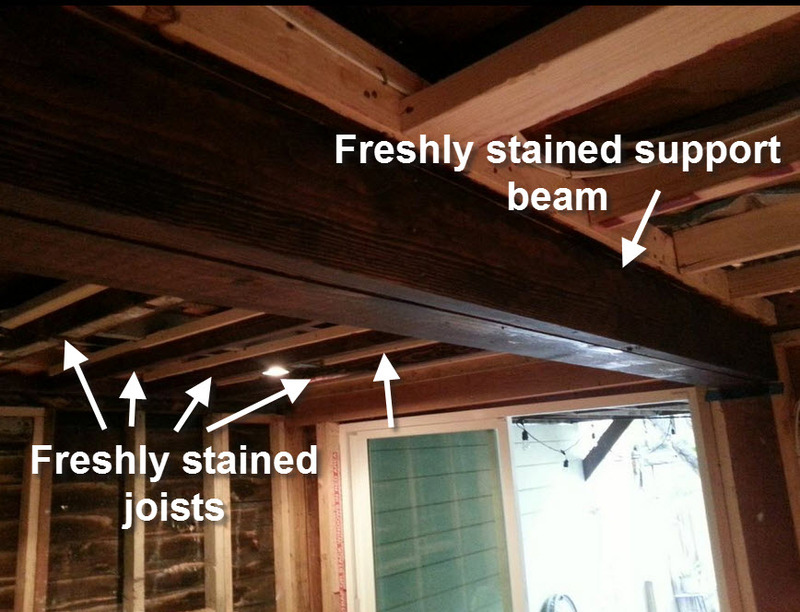 Since half of the room has beautiful old (original) Douglas Fir ceiling joists, and the other half of the room has new construction Douglas Fir, there is a noticeable difference between the colors of the two types of wood. The old wood is dark and rich like a freshly brewed cup of coffee, while the new wood is bright and golden like the afternoon sunshine. 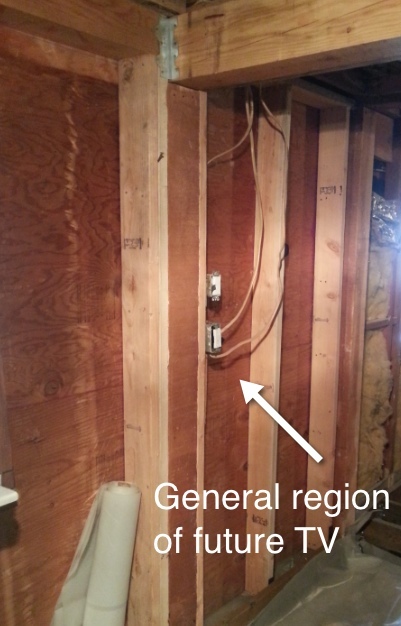 With that work done, all I need to do is get the electrical to install one more outlet, get the plumber to set the tub and I’m on to insulating the walls and putting up drywall. Then things will get really exciting! In case you noticed a drop off of “Building With Beth” posts over the last week it’s because I’ve been on a luxuriously relaxing vacation. 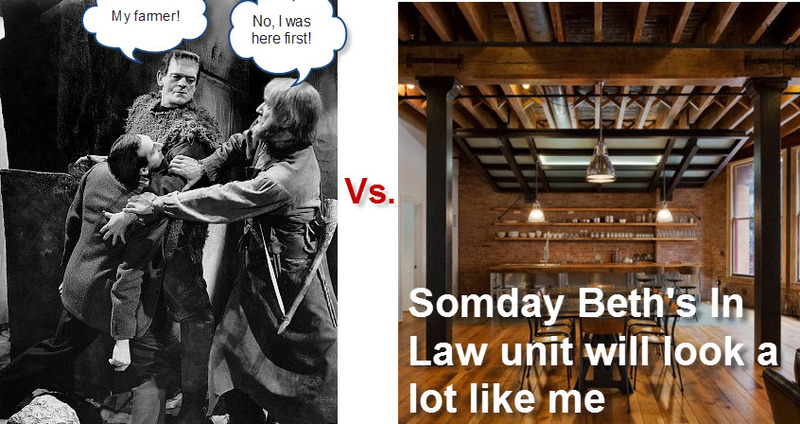 Now don’t start thinking that I didn’t spend any time working on the In Law unit. It was my vacation after all. I had to take full advantage of my open afternoons and scheduling flexibility. While the first half of my week was spent soaking up the sun and hiking the trails in the beautiful Santa Cruz mountains, the second half of the week was spent bringing a little light into the dim and dark In Law unit. That’s right, it’s time to install some windows! 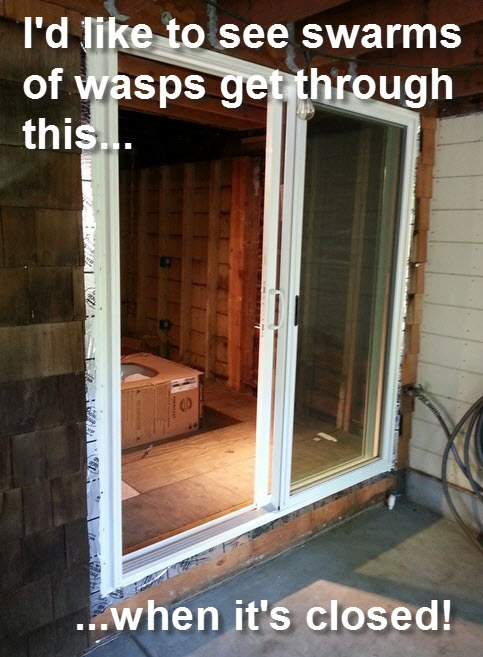 Well, one window and one sliding glass door to be specific. The second window that needs to be installed was accidentally ordered in the wrong size, so that installation will be a different post. Therefore, today we will be installing one new window and the sliding glass door. 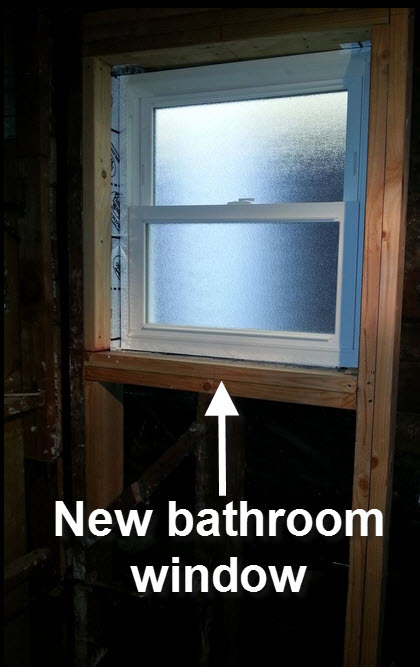 Window 1 – The Bathroom: Technically the window in the bathroom is called a “Jalousie” Window, but I’m pretty sure that’s just a marketing ploy to make these ugly slatted glass windows sound fancier. Window 2 – Future Sliding Glass Door: This is a basic single-paned glass window, but someday it will be either a glorious sliding glass door, or a massive breach in the fortified walls of our castle. Since I’ve never installed a window or a door before, I brought in a little help for this task. 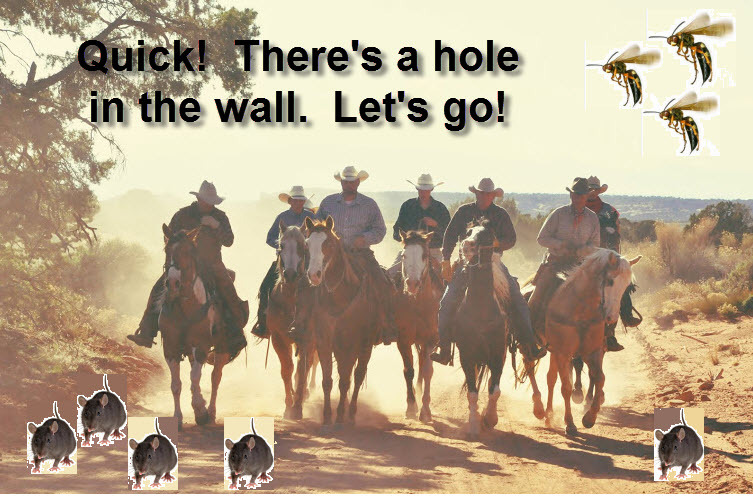 There is something intimidating about cutting a hole into the side of your home and exposing the inside to nature and/or bandits. 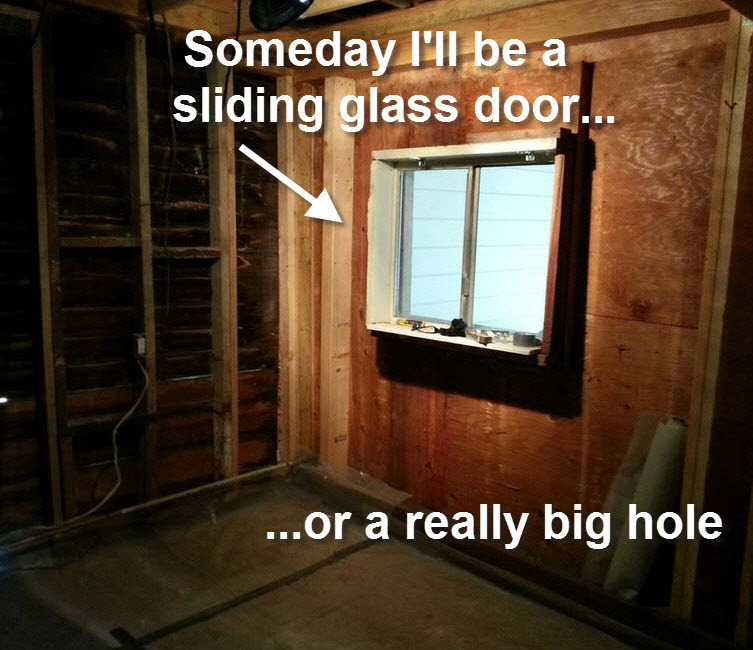 Not to mention that the framing needs to be done properly or the window / door simply won’t fit. 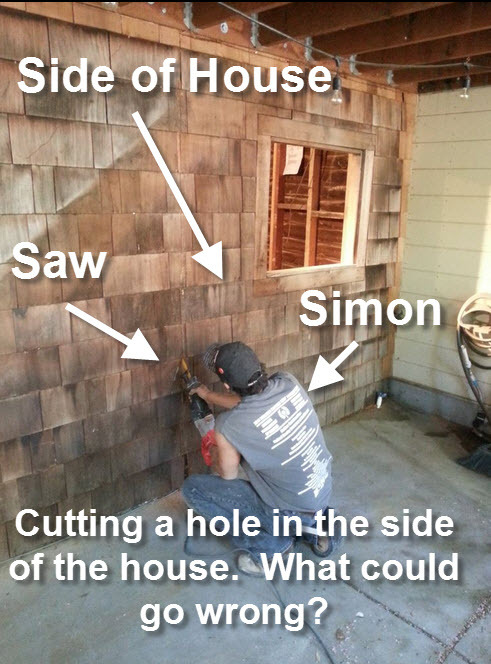 To make sure this was done right, I brought in one of the guys who has helped me through this project, Simon. 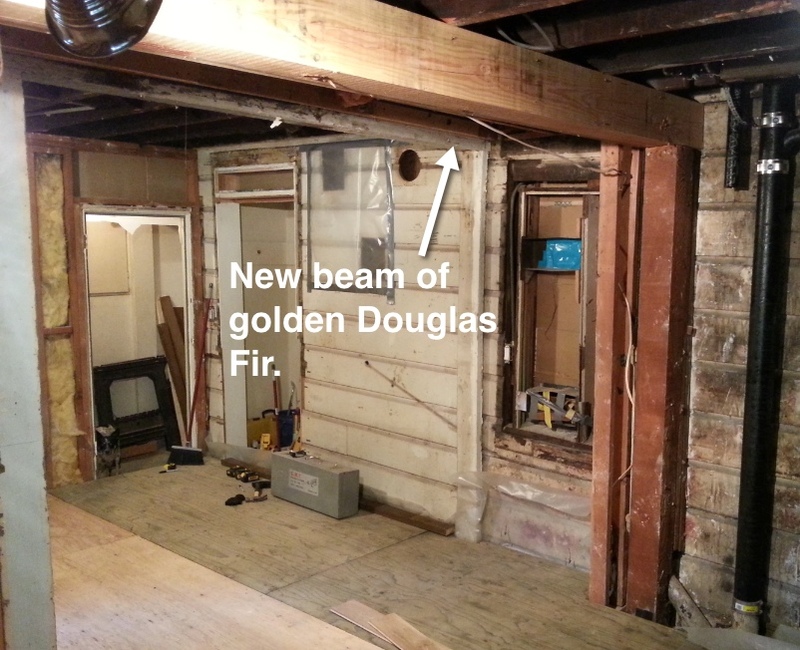 We began by reframing the spaces where the new window and the new door will be installed. Since the space for the sliding glass door was already framed, we only need to cut the hole where we should be able to (in theory) simply pop the new door into place. Once the hole was cut we could stick down the waterproofing membrane. 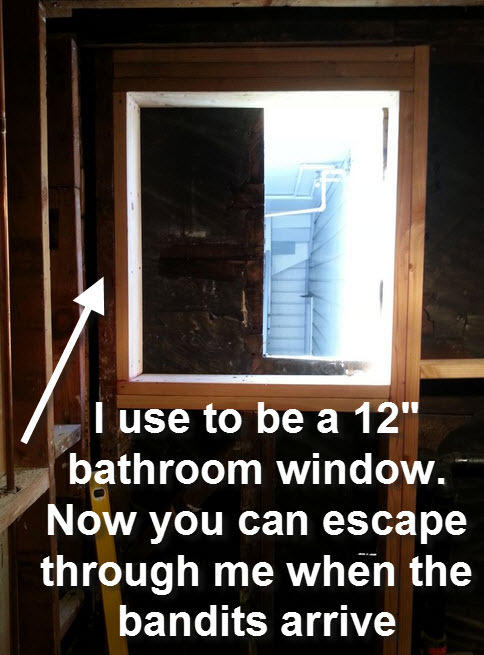 Once we finished cutting out the opening for the sliding door, we moved onto the bathroom window. 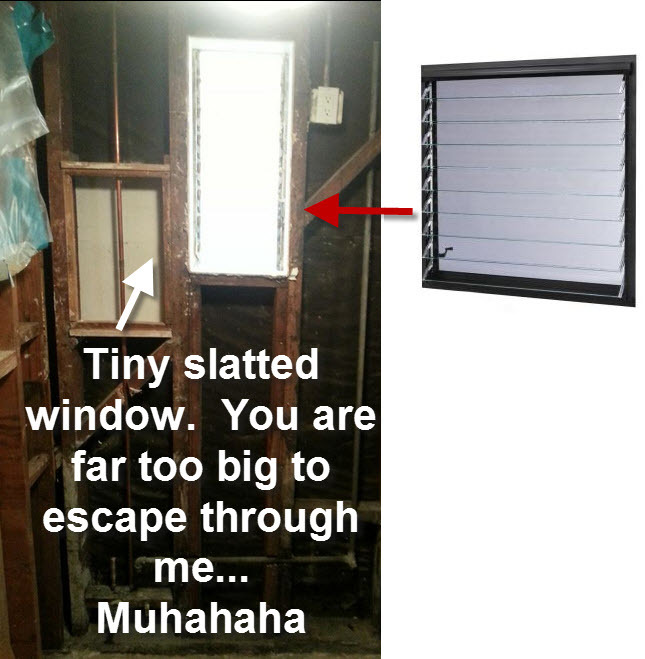 The original window was tucked in between two studs, and was less than 12″ wide. The new window will be nearly twice that size. 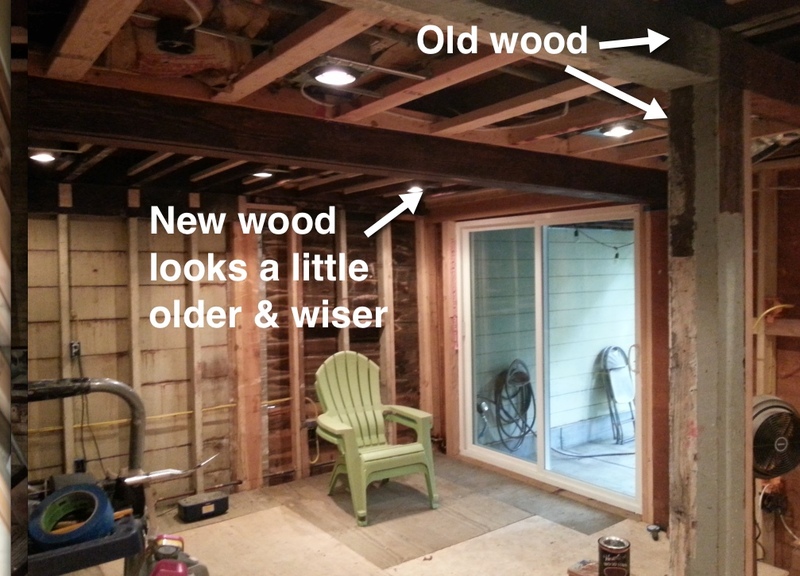 This meant that we had to add some new framing and expand the size of the original window opening. Frame out the space where the window will live. 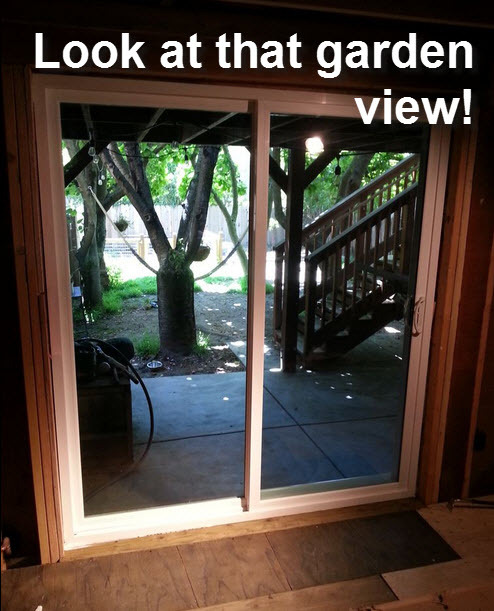 Make sure that the new opening is 3/4″ wider and taller than the actual size of the windows/door that you ordered. 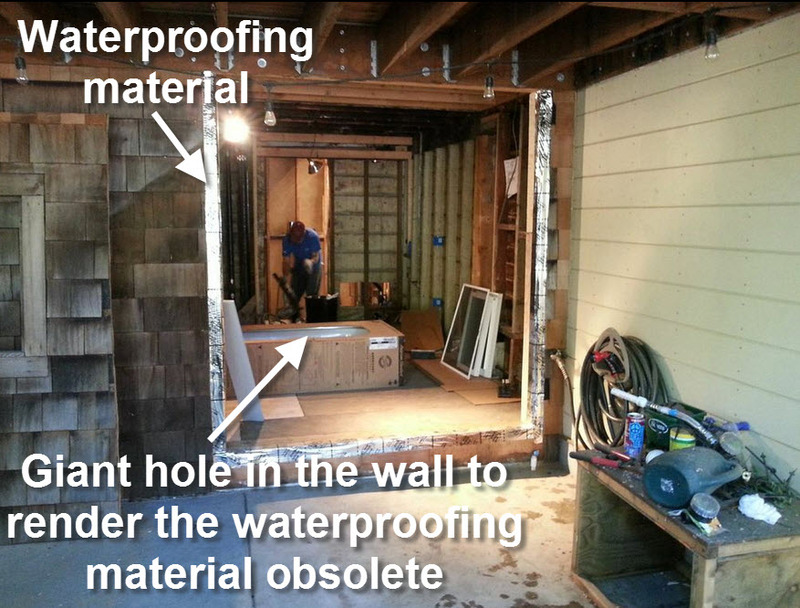 Install the waterproofing membrane in that opening. Now the real test will come when the reordered window arrives and I need to install it all by myself. I’m pretty sure that I’m prepared for that challenge, but I’ll let you know how it goes! I suppose that when you end your most recent post with “we will see what surprises are in store for me over the next few days,” you’re almost asking the universe to surprise you with something special. While I‘m going to try to not read too far into this, the universe has decided to surprise me with a foot and a half long crack in our home’s sewage line. 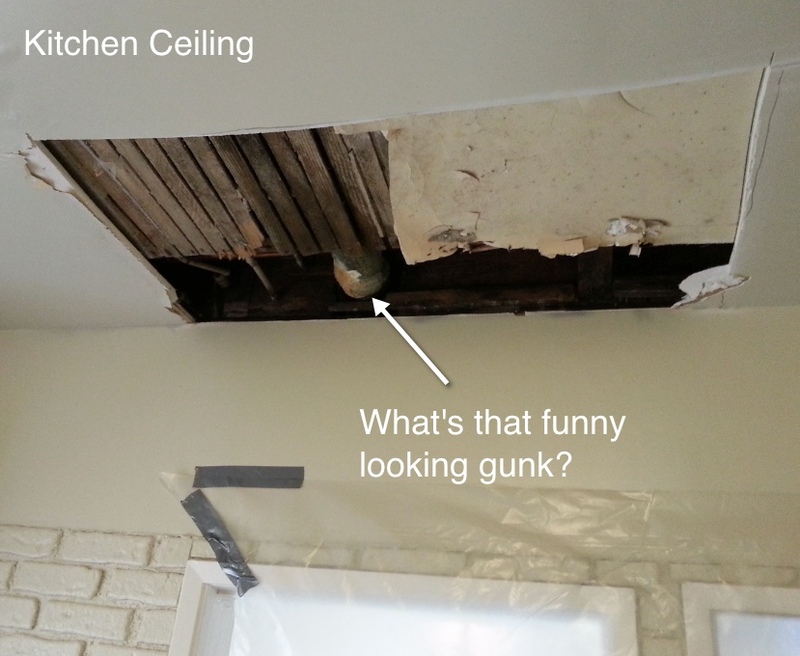 After opening up the walls in the In Law unit a couple of weeks ago, we found some pretty major water damage, along with clear signs of an ongoing leak. My rough guess is that the leak has been happening for around 20 years. I mean, it takes awhile to disintegrate over a foot of wood. Needless to say, it was finally time to find the culprit. 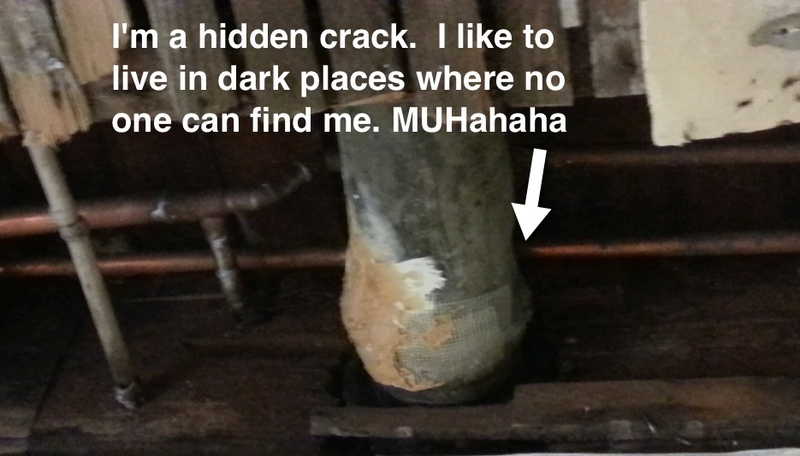 After putting on my sleuth hat, I took the day off of work and met the plumber so we could investigate the source of the leak. 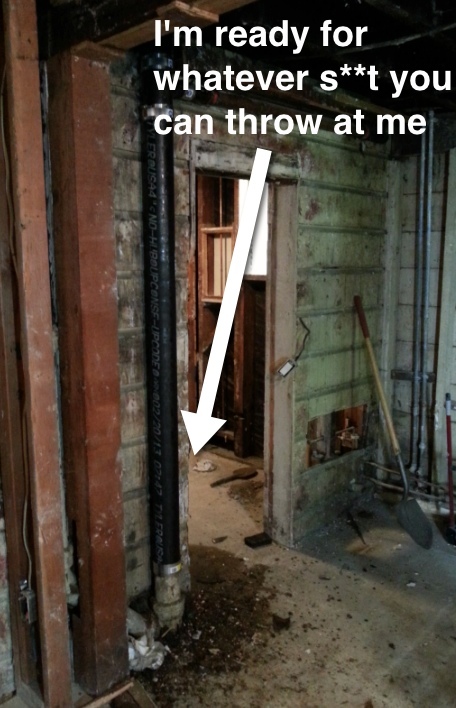 Naively, the lack of foul odor led me to believe the leak was coming from a water line. Well, I’m not sure what’s wrong with my sense of smell, but as it turns out we found not one…not two…but three cracks in our sewage pipes. There was, of course, the afore-mentioned foot and a half long crack. Then there was a hole on the toilet flashing (which connects the toilet to the sewage line) that had been DIY-fixed with some sort of putty. And finally, there was another hole on the opposite side of the flashing that had not been DIY-fixed. Now I’m not trying to ‘diss’ DIY home repair. I mean, I’m a DIY’er and I have the magic of the inter-web at my fingertips. Imagine in the days of yore, when indoor plumbing was a new-fangled luxury and plumbers were just former stable-hands that were trying to get in on the crazy pooping indoors fad. It must have been a lot harder to become a properly educated DIY’er. With that said, purely from a chemistry standpoint, some materials are more porous than others. 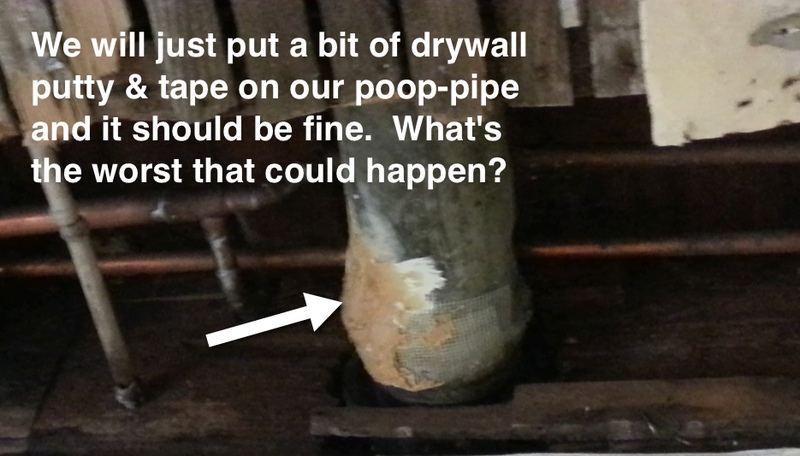 I’m no chemist, but my guess is that drywall putty is on the more porous spectrum, therefore, not being the best choice when trying to fix a leak. With all that aside, there are some positive, and some negative, things that have come out of this experience. On the negative side of things, our poop-pipe was leaking (for 20 years), resulting in some significant dry-rot in the In Law unit. 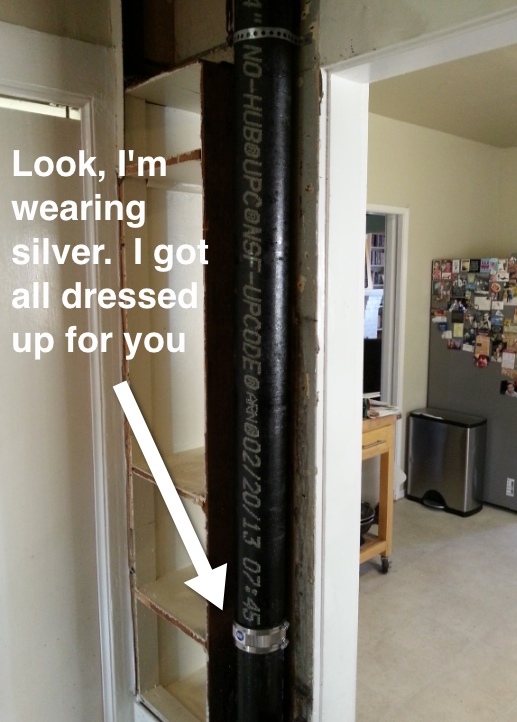 This realization meant we had to remove the pipe. 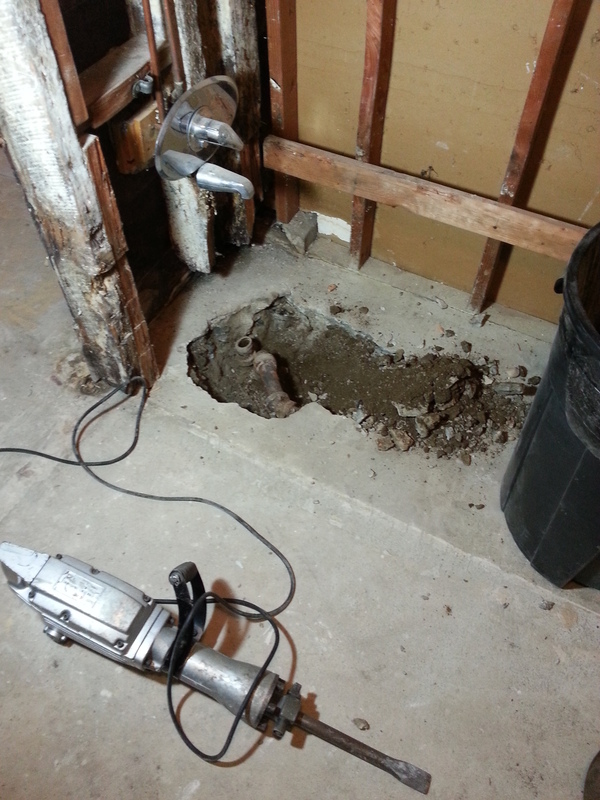 Removing a pipe of this nature is not only difficult, but also a bit gross. The positive side to this whole thing, however, is two-fold. 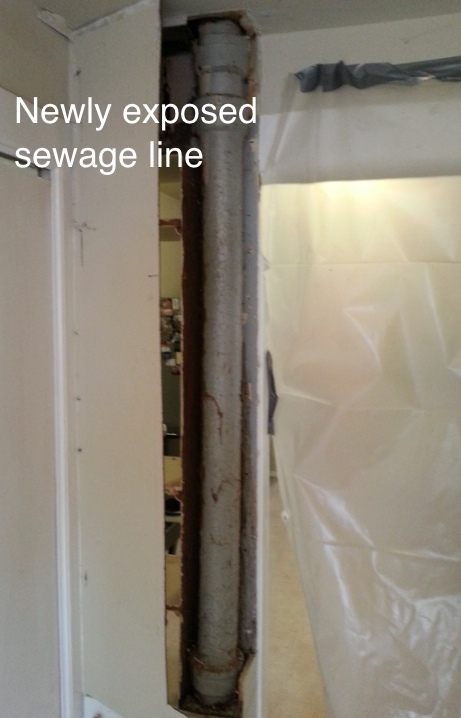 First, we have a brand new poop pipe that stretches the entire length of the house. 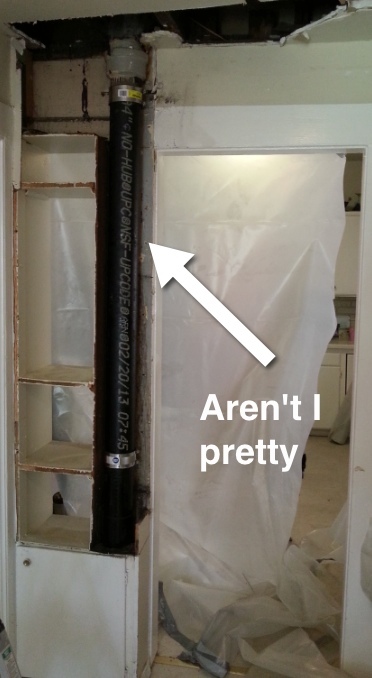 It’s almost a shame to cover it back up with drywall, but I don’t think that visitors will get as much joy as I do looking at this leak-free pipe. Second, I was able to spend a lot of the day working on the floor in the In Law unit while the plumber worked his magic in the house. I made some significant progress, however, it’s not quite done. For this reason I’m going to wait to share it when there is a finished product. After all, I want it to be a surprise. Just to be clear, the GOOD kind of surprise. You may be wondering what has been happening over the last few days. 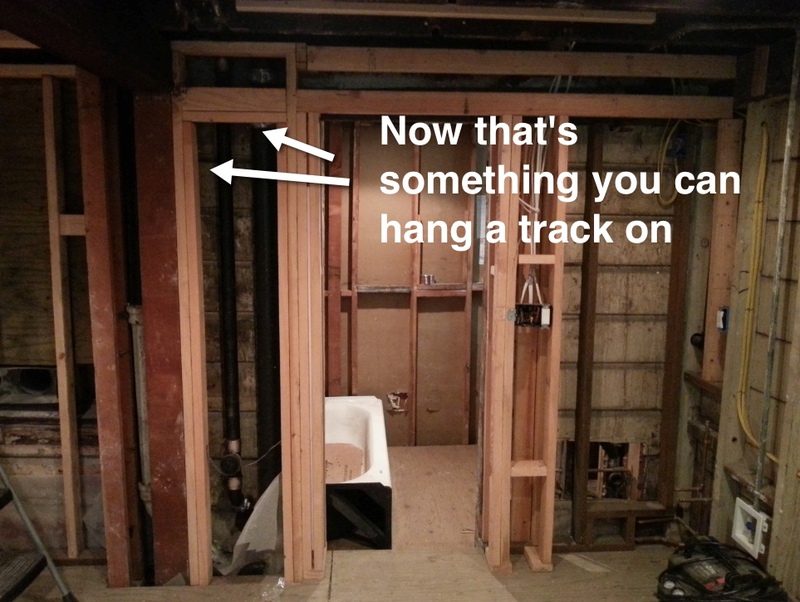 As you may recall, last weekend I made some great progress on projects that required reaching over my head. Well, what I didn’t mention was that I also made some minimal progress on projects that required me to be hunched over. Specifically, showing that jack hammer who’s boss. Well, as it turns out, the jack hammer is boss. Also, I’ve renamed the jack hammer, the back hammer. Unfortunately, it is about half the size that it needs to be for the plumber. I expect that digging will resume in the next few days. 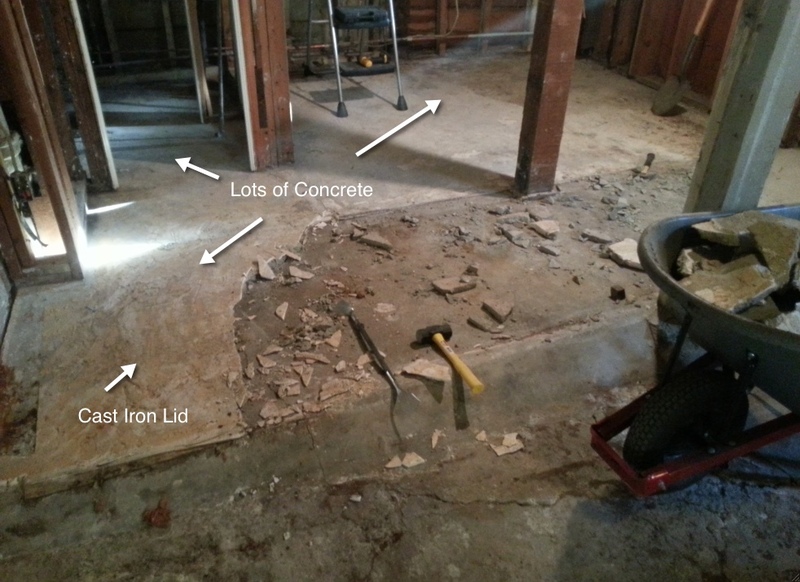 The problem is trying to build a sub-floor to handle all of the varying levels of concrete. 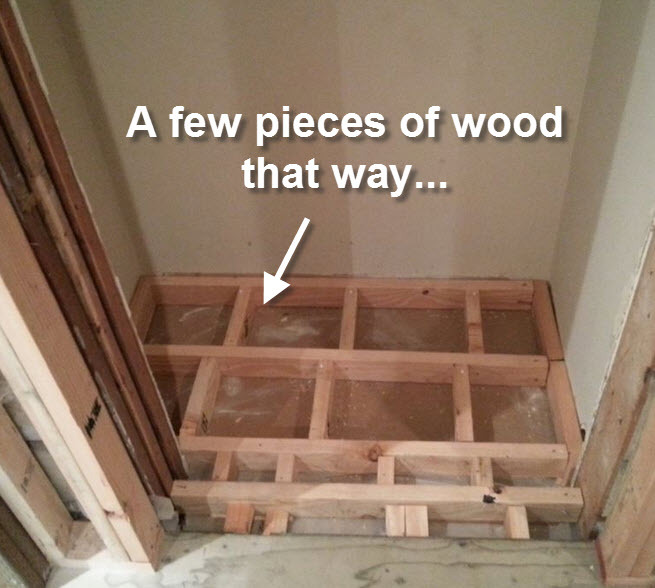 My plan is to use 2″x6″ pressure treated wood to build out the framed sub-floor. 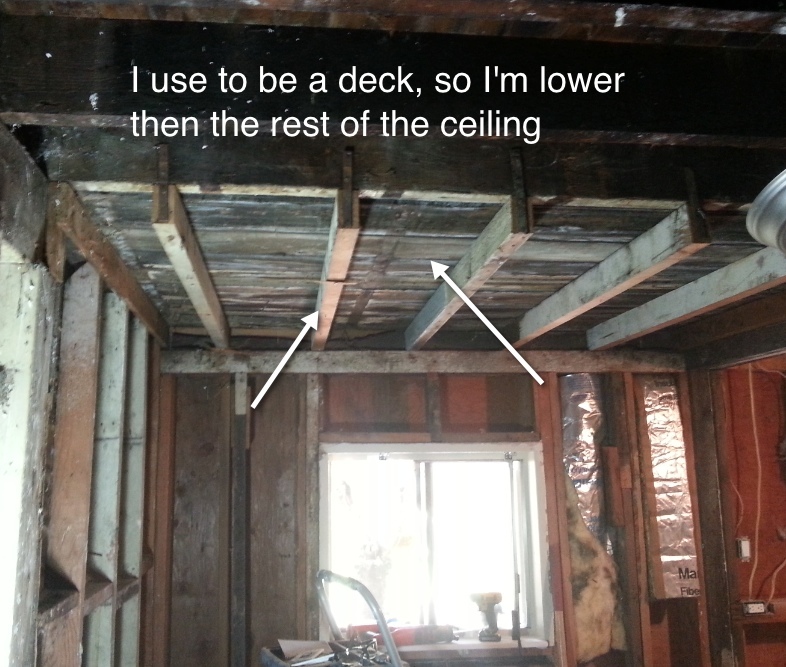 I’ll install a header joist on top of the “curb” (aka foundation) and attach it to the wall. 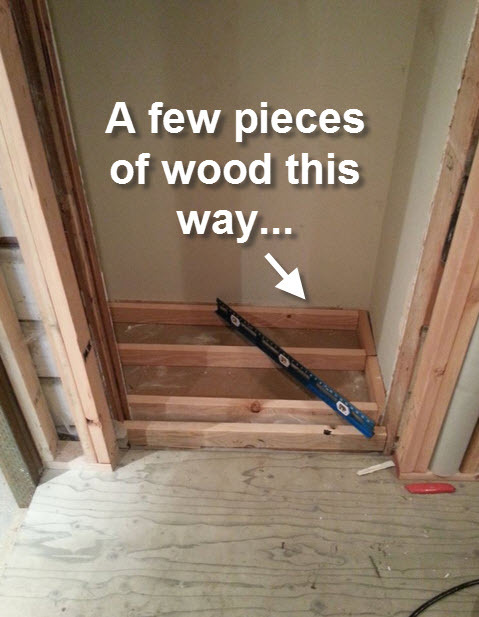 Since I will be using pressure treated lumber, I think I can get away with not installing a ‘sill plate.” If you have any expertise in this area please feel free to chime in. 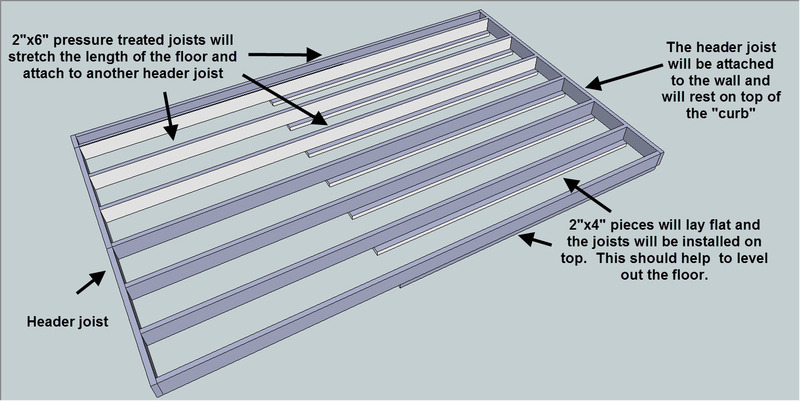 Adding the sill plate would raise the floor up another inch & a half, which I’d like to avoid. From there I’ll frame out the floor. 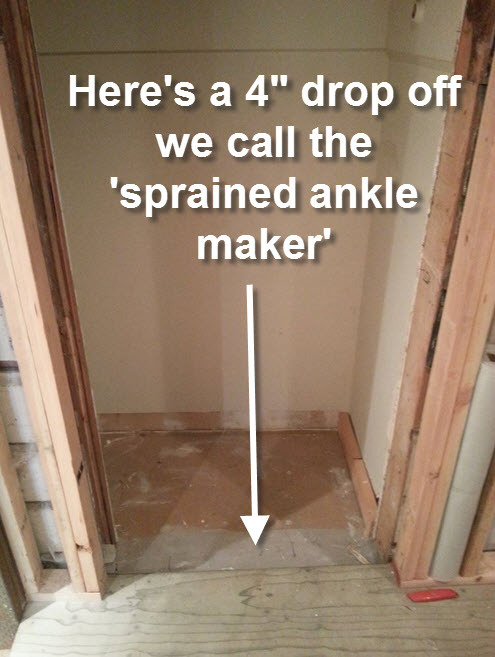 There is about a 4″ difference in floor height from one side of the floor to the other. 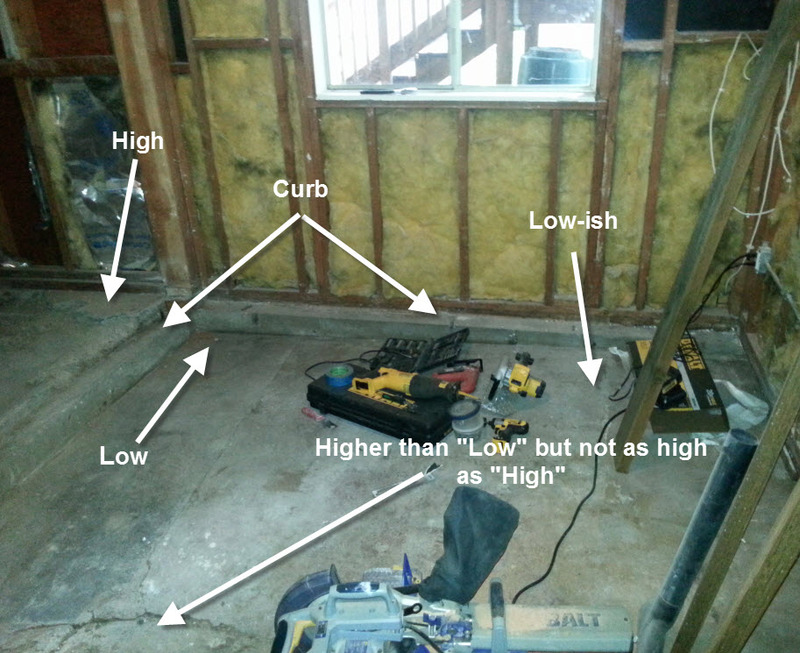 I’ll have to put in a few wedges and 2×4’s to level things out, but I think I can do it. Looks easy enough. 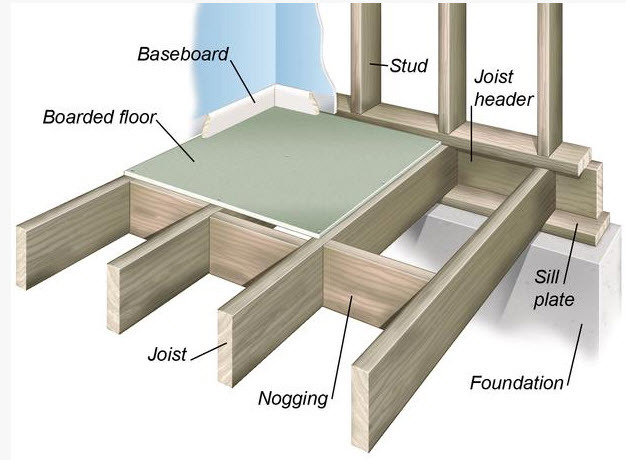 Considering I’ve never framed anything before, I suspect I’ll learn a lot in the process of building this floor. I find solace in knowing that the worst that can happen is that it won’t be level or that the floor will feel squishy. 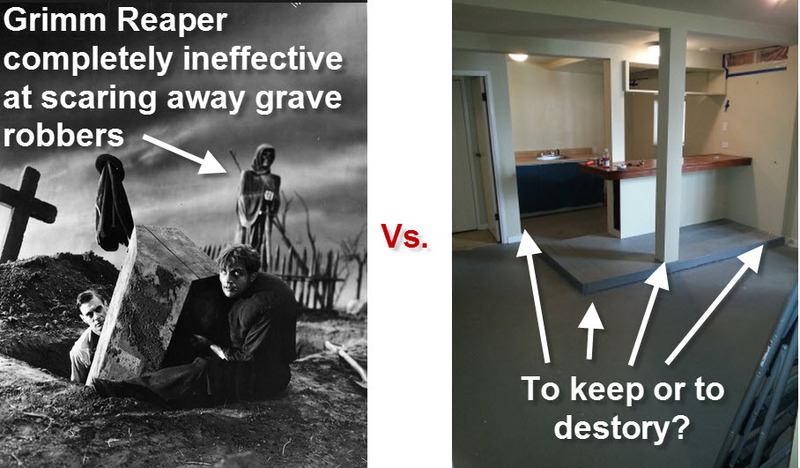 Either way, it’s still an improvement over what the floor is currently like. Today has been a very fruitful demolition day! 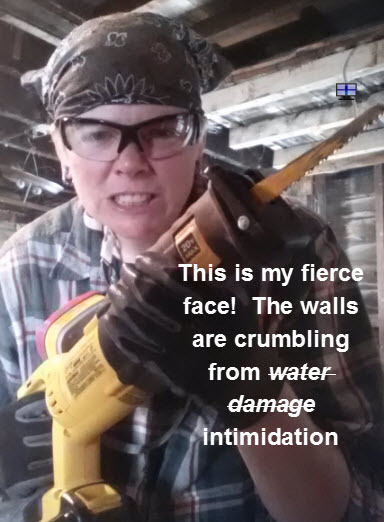 You might think that demolition usually results in things going away…well, today demolition both removed things from my life and added things to my life. 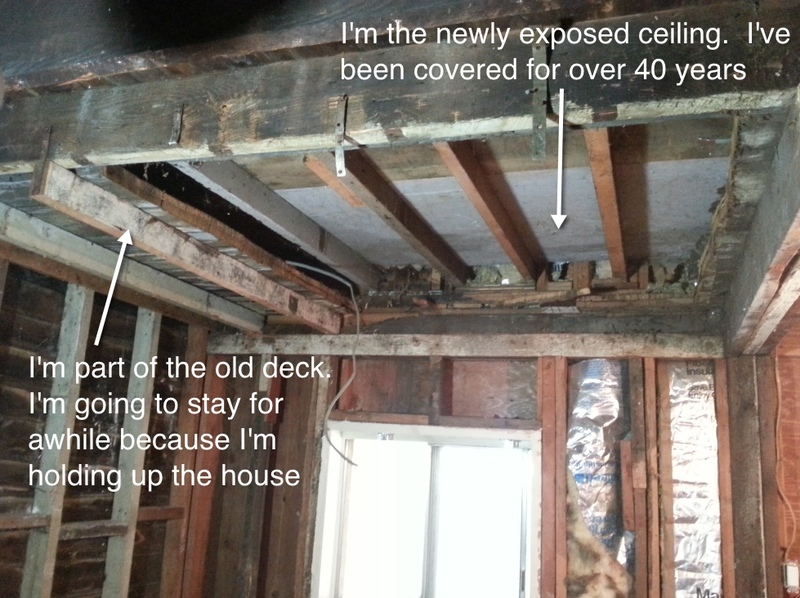 From a removal standpoint, with a little help from my trusty new reciprocating saw, I was able to rip down that old deck/ceiling. As you can see, quite a bit was removed from the ceiling. What you can’t see, is everything that was added to my life during the demolition. 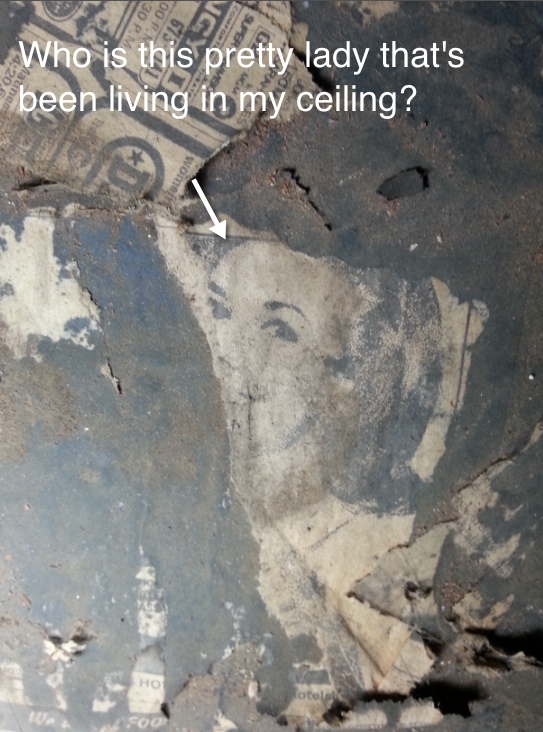 First, you might be wondering why the picture above says the ceiling was covered for 40 years. I mean, the ceiling doesn’t actually speak to me, so how did I come up with that arbitrary length of time? Well, it’s not just my house-whispering ways…it’s in the news! 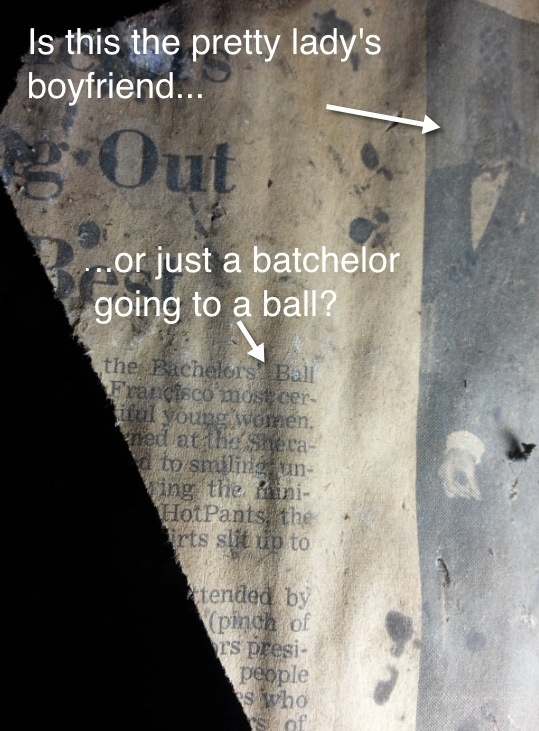 These useful and informative newspaper clippings were inside the ceiling when it came crashing down. You might be thinking “wow! what a lucrative find!” Yes it was, but that’s not all I found. You see, much like other large cities, San Francisco has its share of wildlife. We have the bison in Golden Gate Park, the hawks soaring the sky, and the critters scampering playfully in the streets. Well, sometimes those critters scamper playfully in the house. I’ve been lucky in my time here that I’ve only found one mouse and that was after my cat joined it for a little roughhousing. Apparently, the previous owners of our home had a bit of a larger critter problem. I’m happy to introduce you to Ricky, Mickey’s cousin from Nor Cal. 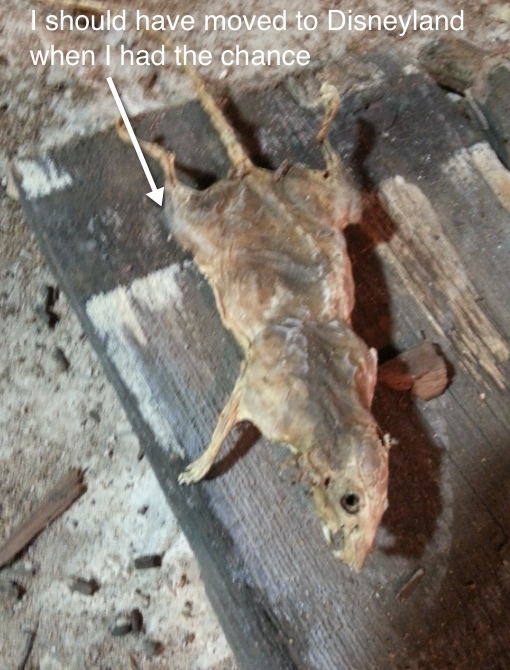 Ricky Rat was nice enough to propel his mummified remains into the air, at an unusually high rate of speed given his current limited mobility, soaring proudly at me in quite a lifelike manner, as the ceiling came down during demolition. Let’s just say that his zombie acrobatics have earned him a special place as a part of this project. Therefore, he is officially the project mascot! Welcome Ricky Rat to the “My First Renovation” extravaganza! There comes a time in every DIY’ers life where they have to decide how far to pursue their curiosity. I walked into this project intensely curious of a number of things. Like, why does the corner of the house slope downward? 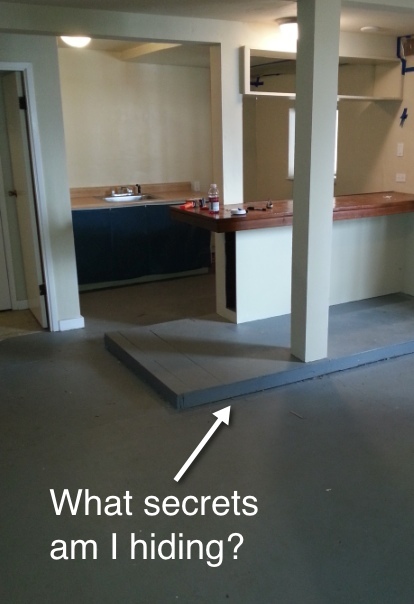 And, what is underneath that strange raised platform in the middle of the room? While some of these questions have been answered (under that platform was concrete…exciting! ), the pursuit of finding those answers have exposed all new questions. 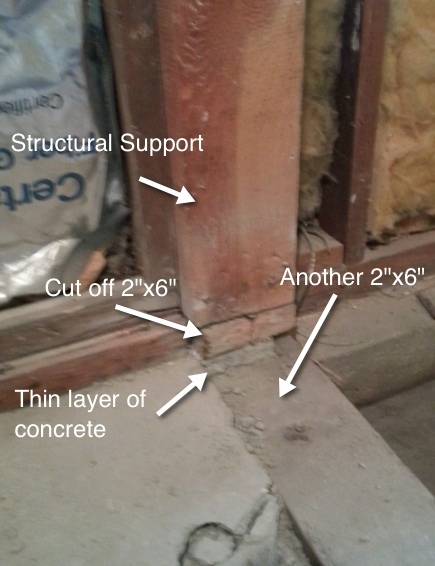 Most of those questions begin with “Why.” Such as…Why did they put a structural support on top of a cut 2″x6, and then sandwich a thin layer of concrete between that 2″x6″ and another 2″x6″? The answer to that question may be lost to the ages. There are an endless number of these “Why” questions, but this weekend I’ve uncovered a whole new breed of question…the “What” question. While chipping away at the thin layer of concrete (using a sledge-hammer because it makes me feel tough) that was poured on top of the foundation, I got to a point where I thought…”I should probably stop unless I would like to rip up the entire floor.” When I sat back to appreciate my handiwork, I found, to my surprise, that there was something imbedded in the concrete I had yet to remove. 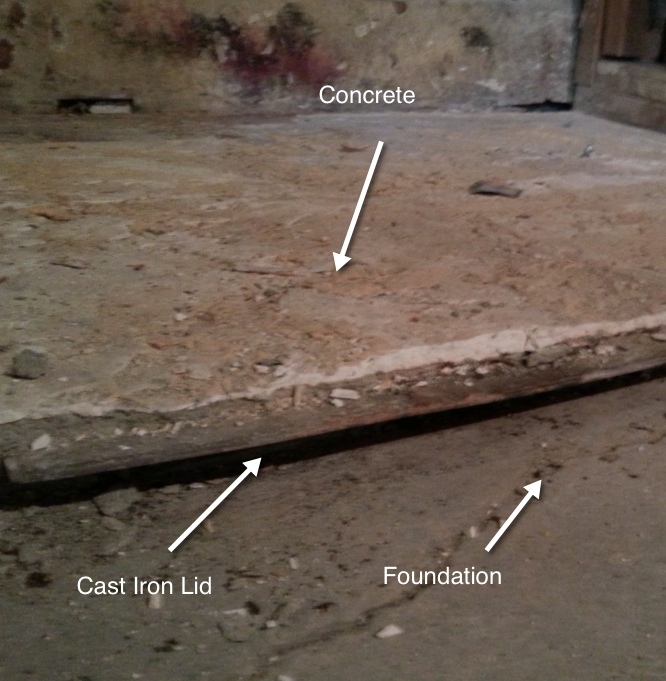 In between the foundation and the remaining concrete is a cast iron lid. Now, you can understand that I am intensely curious as to what is under this lid. Dreams of gold-rush treasure keep coming to mind. I mean, I’m not a greedy person. I’d be happy with one moderately sized golden nugget. At the same time, this iron lid could be massive, and could require me to completely rip up the floor to find out what it is hiding. Realistically, what are the odds that there is buried treasure under that lid? I’m guessing that the odds are higher that there is something I don’t want to find under there. Probably nothing as dramatic as a human body, but also nothing as awesome as a buried treasure. I’m thinking something more like a lot of dirt where the foundation wasn’t poured, or a nest of attack spiders. EIther way, I’ll probably leave it where it is and let the curiosity fill me with dreams of riches. Of course I say this now…but tomorrow I might take a sledge-hammer to it. 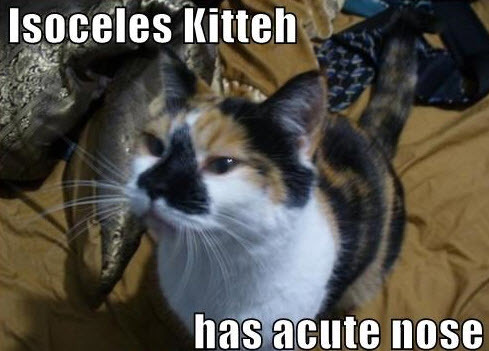 What was it that curiosity did to that cat again? Did this use to be a barn? I was talking with a friend of mine the other day and he was suspecting that my current In-Law unit was once a deck that was enclosed. 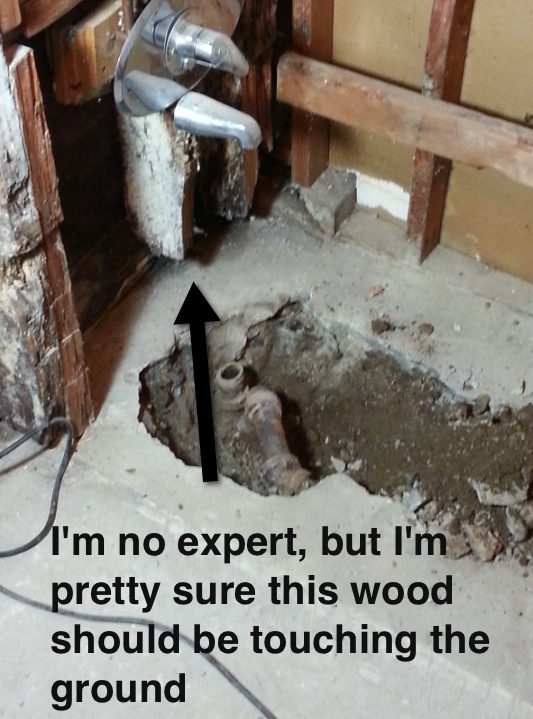 This would explain the strange mixture of new and old wood that I’ve found underneath the drywall. Well, today the asbestos guys came out and nearly completed the demolition of the room for me! (Yay for asbestos guys!) All that’s left is that subfloor and a little insulation. If you ask me, now it resembles more of a rustic barn then either a deck or an In Law unit. On the positive side, there is a secret part of me that always wanted to live in a barn. 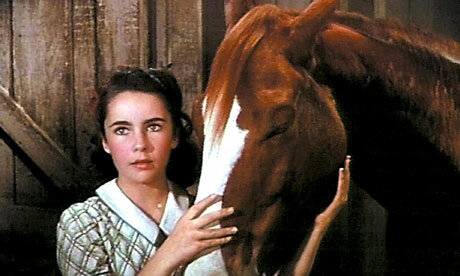 I’m pretty sure that I can thank my childhood love of horses and the film ‘National Velvet’ for that.